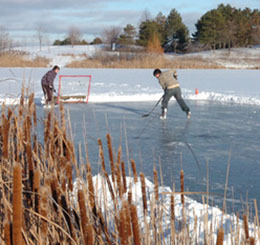 Picture of Winter Aeration in a Pond. A: I recommend leaving the bubbler aeration system running throughout the entire Winter. Running the aeration system during the Winter is as important as running the system during the hot Summer months. Preventing Winter Fish Kills with Aeration: The problem with not running your system during the Winter is the increased probability of have a Winter fish kill come Spring. A Winter fish kill is when toxic gases from dying or rotting vegetation accumulate underneath the ice. With no hole in the ice to allow for these gases to escape, the fish can suffocate. The Proper Time to Remove the Bubbler Aeration System: If you plan to ice skate on the pond or if you have quite a bit of snowmobile traffic on the pond, then I would strongly recommend not running the bubbler aeration system at all during the Winter. Removing the aeration system is simple. Disconnect the airline(s) attached to the cabinet and compessor. Cap the airline(s) or use duct tape to ensure no dirt or water can get into them. Store the cabinet and compressor in a cool, dry place. The diffuser at the bottom of the pond is fine to leave in there throughout the Winter. There is no need to remove it.